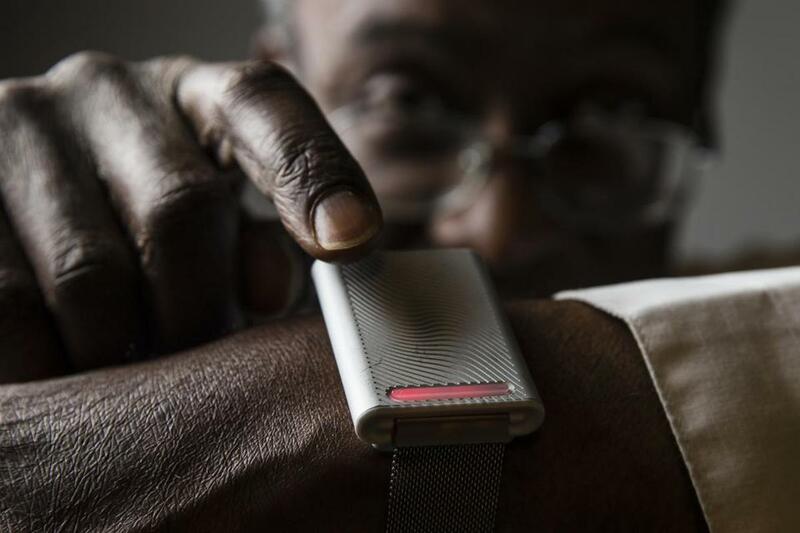 An Embr Wave, a device that straps to your wrist like a watch to help change the feel of your body&apos;s temperature, is displayed. The Embr Wave is the sort of gadget you might see on a TV infomercial at 3 a.m. — a chunky little box that straps around your wrist like a watch. Except it doesn’t tell time, but rather functions like a personal thermostat, cooling you off when you’re hot or warming you up when it’s chilly. It sounds crazy, and even a little scammy. But before you grab for the remote, check out the cast of characters. The Embr Wave was designed by three guys from the Massachusetts Institute of Technology, two with doctorates in materials science. Their Somerville-based company, Embr Labs, has attracted venture investment from a pair of technology titans, Intel Corp. and Bose Corp., as well as a $225,000 research grant from the National Science Foundation. Researchers at the University of California at Berkeley who tested Embr Wave on their students say it works. At even at a hefty $300 a pop, Embr Labs has sold more than 4,500 bracelets in just six months. If this is just a gimmick, it’s a mighty effective one. Co-founder Matt Smith acknowledged that the whole thing seems quixotic. When he and MIT colleagues David Cohen-Tanugi and Sam Shames came up with the idea several years ago, none of them were convinced it would work. In 2013, the three men entered an MIT contest to devise practical uses for advanced materials. Their inspiration came from sitting in a school lab where the air conditioning was way too cold. Instead of donning sweaters, they decided to invent a way to warm up one person without affecting the surrounding environment. The Embr Wave bracelet contains a Peltier device, a heat exchanger made of multiple layers of different materials that get hot or cold when electricity is passed through them. By reversing the flow of current, the Peltier device can either cool or warm a person’s skin. The Wave doesn’t generate nearly enough heat or cold to change a person’s core temperature. But Sam Shames told me that’s not the goal. Instead, the Wave is supposed to work like downing an icy beer in July or holding a steaming cup of coffee in January. It’s the sudden surge of heat or cold that makes us feel better, even though our core temperature has hardly changed. The Wave bracelet contains software that varies the effect, producing pulses of heat or cold that you feel on your wrist through the bottom of the device. It’s this constant variation that helps make it effective, Shames said. You adjust the setting by pressing one end of a temperature bar for warm, the other for cool. Still, the effect isn’t dramatic, like walking into a sauna or a stand-up icebox. In fact, it’s largely psychological. The Wave makes people feel cooler or warmer even though their body temperature hasn’t changed. It sounds a bit like voodoo, especially since Smith said the Wave has no effect on people who are already comfortable. Hui Zhang was a skeptic. But then she tried it out on students at the University of California at Berkeley, where she is a researcher in “human thermal comfort.” The experiment put 49 students in rooms that were either too hot, or too cold. After wearing the Wave bracelet for 30 minutes, she said the students reported a distinct improvement, roughly equivalent to a five-degree increase or decrease in room temperature. “I was surprised when I looked at the results,” Zhang said. Alas, the Wave had almost no effect on me. It’s been a chilly April, good weather for testing. And while the device got warmer or cooler on demand, it didn’t do much to heat up my fingers. I did feel a bit warmer, but in a chilly room I wasn’t that much more comfortable — certainly not enough to justify the $300 price. But maybe I’m just not the Wave’s target audience, the people whom Shames calls, the “thermally underserved.” He told me that the now-familiar room temperature standard of 72 degrees Fahrenheit was established in the 1960s by testing men of average build, dressed in suits. No thoughts of female metabolism, nor adjustments for the rise of business casual. As a result, many of us are always complaining it’s either too warm or too cold at the office, and these people are Embr’s core market. Smith thinks that if enough buy a Wave bracelet, office buildings can turn down their heaters and air conditioners, saving companies millions in energy bills and easing demand for fossil fuels. So the Wave is more than an odd-looking wristband. It just might be a secret weapon in the fight against climate change. Alas, you can put me down as a non-combatant.